San Diego celebrated Earth Day on Friday by showing off local clean technology, freeing rescued sea lions and cheering the signing of the landmark Paris agreement on climate change. 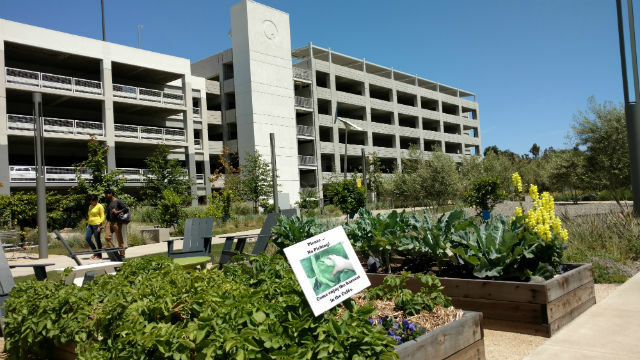 Qualcomm opened its latest smart campus to the media, showing off a complex in Sorrento Valley that includes rows of electric vehicle chargers, wirelessly linked temperature sensors and an organic garden that provides some of the food for employee cafeterias. “This campus is a fantastic test bed for us,” said Ashok Tipirneni of Qualcomm’s Smart Cities and Industrial Internet team. He said Qualcomm is working to commercialize technology for “intelligent buildings,” starting with its own 120 buildings worldwide. SeaWorld recognized the day by releasing three sea lions rescued in a dehydrated and malnourished condition and rehabilitated over several months in San Diego. At UC San Diego, political and science leaders met to discuss San Diego’s role in the successful 2015 climate talks in Paris. Assembly Speaker Toni Atkins, who was in Paris for the talks last year, said the California delegation was treated like “rock stars” because of the state’s commitment to 50 percent renewable energy by 2030. “I felt really proud to be part of California,” she said. California Gov. Jerry Brown joined dozens of world leaders at the United Nations headquarters in New York on Friday to participate in events marking the signing of the Paris agreement on climate change..